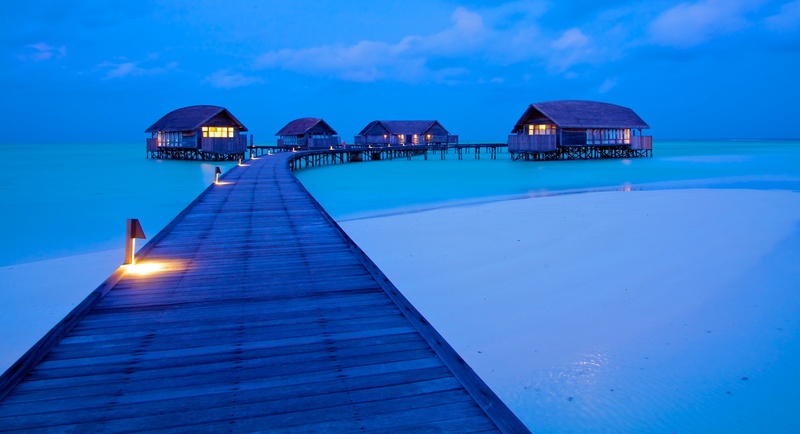 A GOOD HOTEL CAN MAKE or break a trip. The worst hotel in the best place is still going to make retiring after a long day an unfortunate experience. 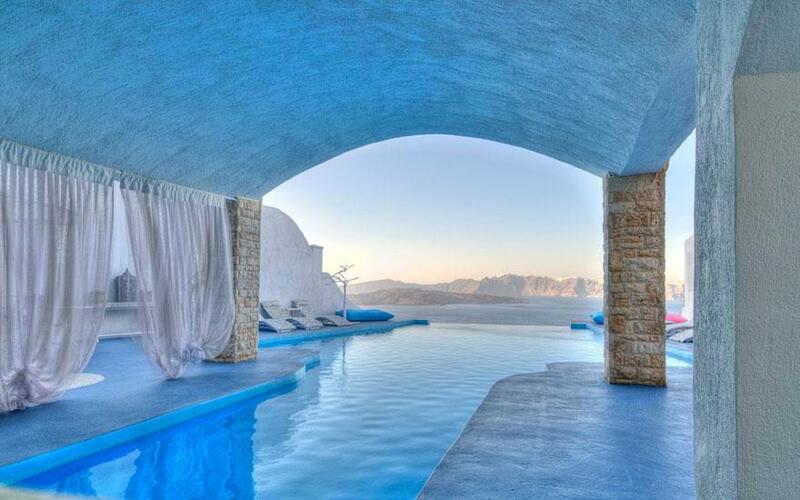 The best hotel in the worst place, on the other hand, can be something of an oasis. 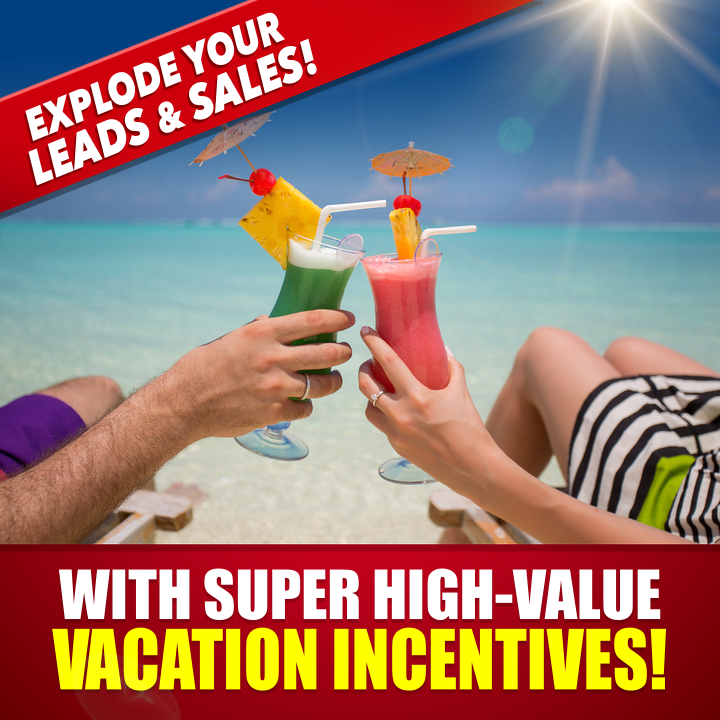 Take the best hotels and put them in the best places, and you’ve got a private slice of the vacation you’ve always dreamed of. 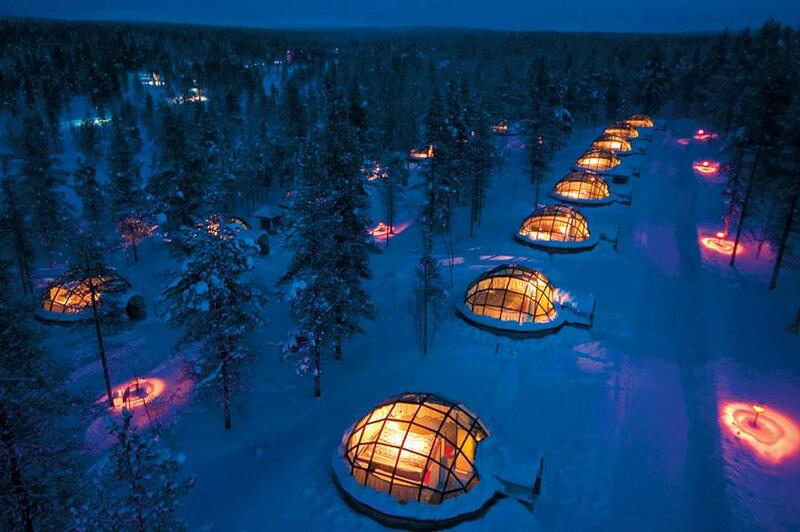 Here are 48 absolutely epic dream hotels. 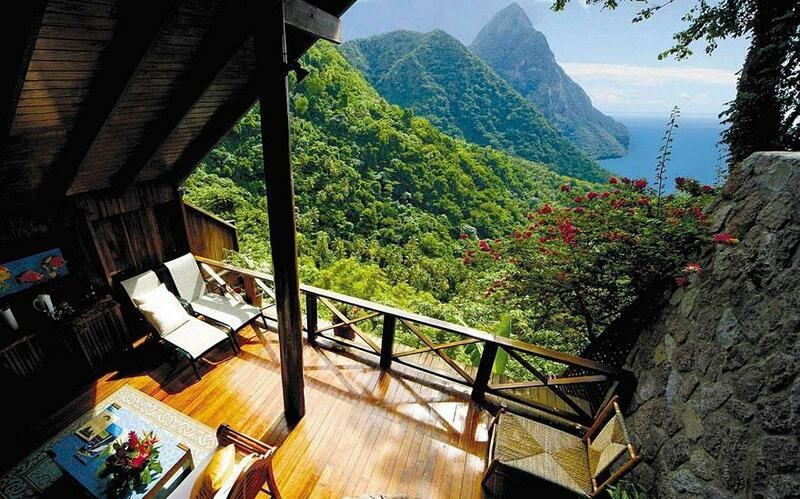 Possibly the singular spot for your perfect Caribbean excursion, the Ladera Resort represents the intersection between design, luxury, and the ideal location. Amenities include a full spa, a host of excursion experiences, and the ability to swing straight from a bench into the pool. 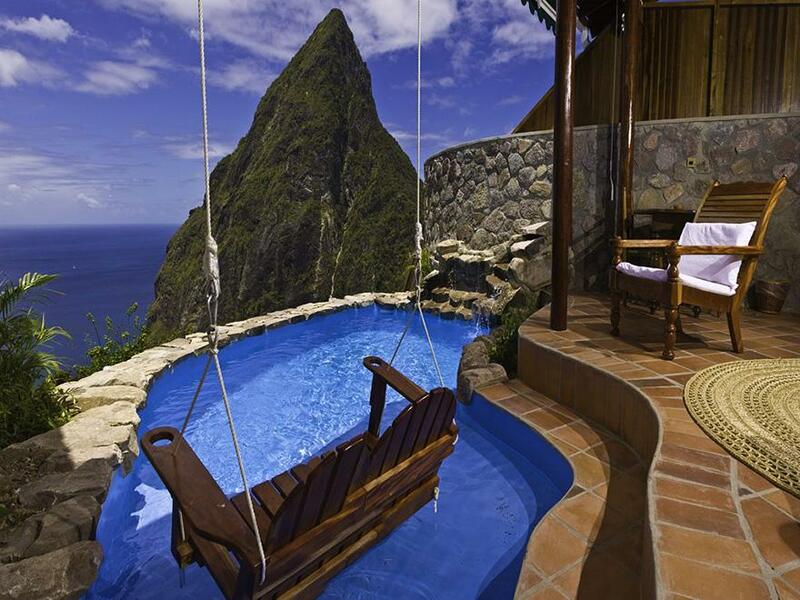 Equally sick: Jade Mountain Resort. 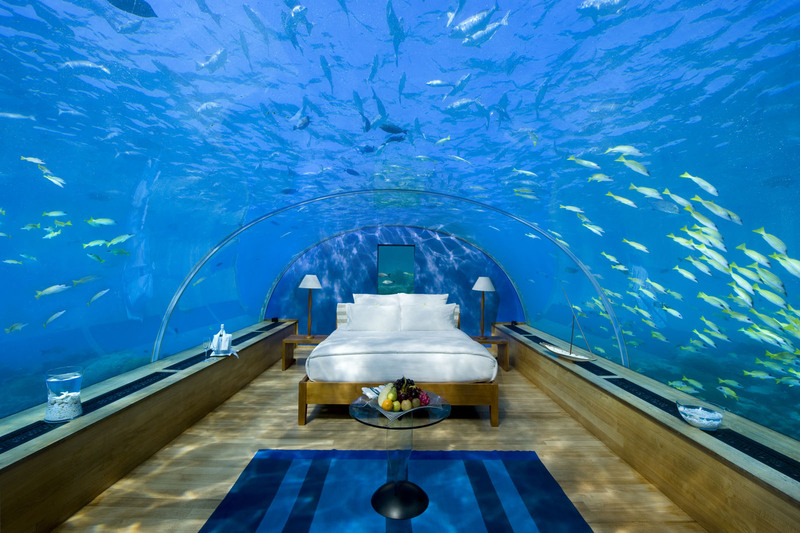 Ever wanted to be able to go down the stairs of your resort room, hoist the blinds, and be stared down by schools of fish? 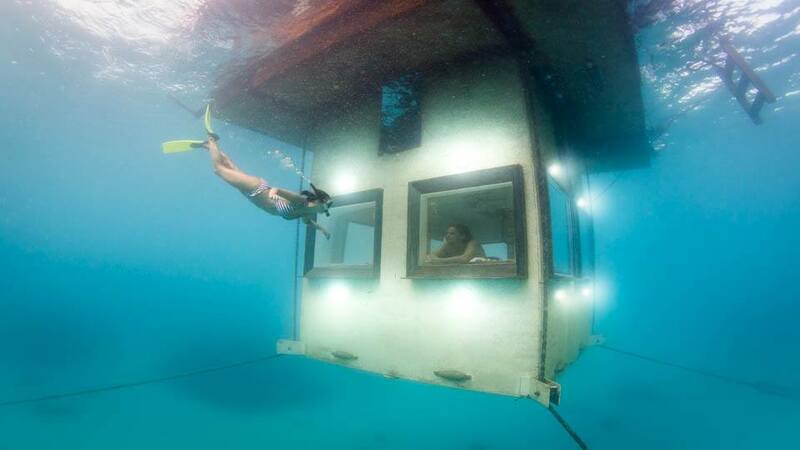 Can you get over the fact that in doing so, you’ll be painfully aware that your accommodations are anchored offshore? 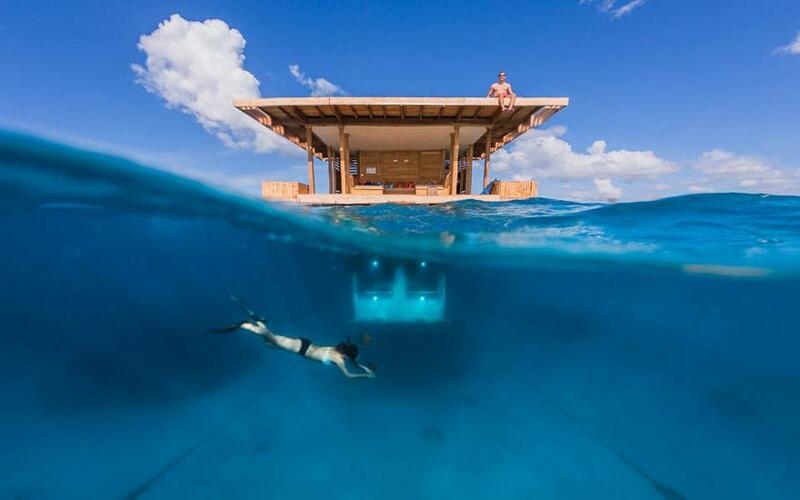 If you answered yes to both of those questions (as I have), then the photos of the Manta Resort have probably inspired you to add Tanzania’s Pemba Island to the bucket list. 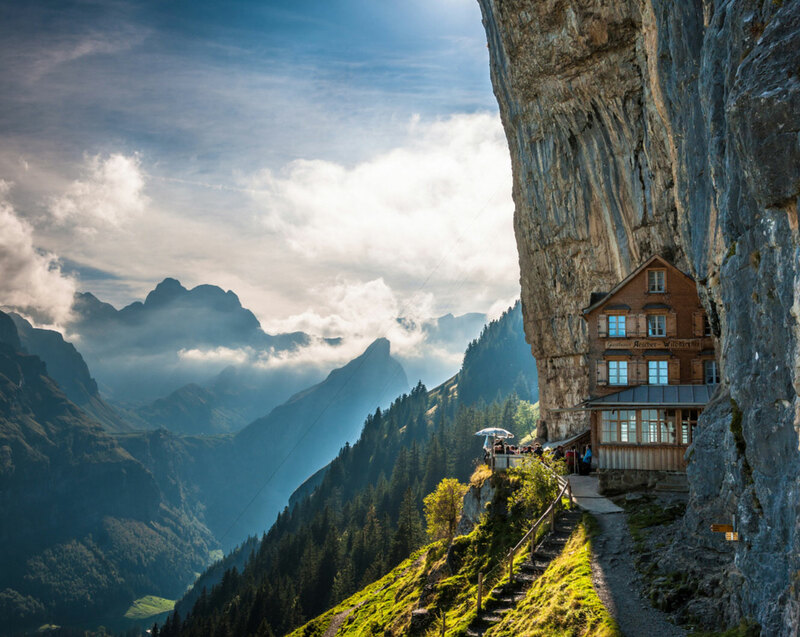 More of an inn and restaurant than a luxury resort, this getaway built right into an Ebenalp cliff is the best spot to take a breather on your trek up the northern Alps. 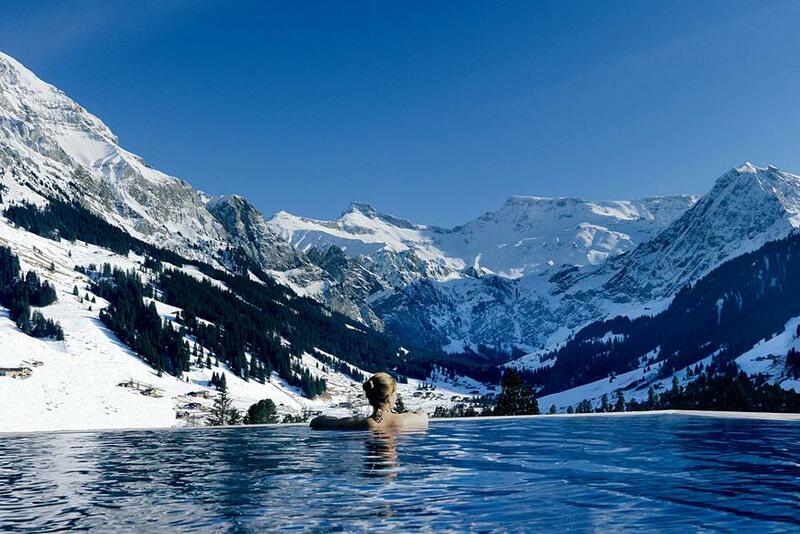 The views here will keep you charged as you continue your trip through the Swiss mountains. These images are not photoshopped. 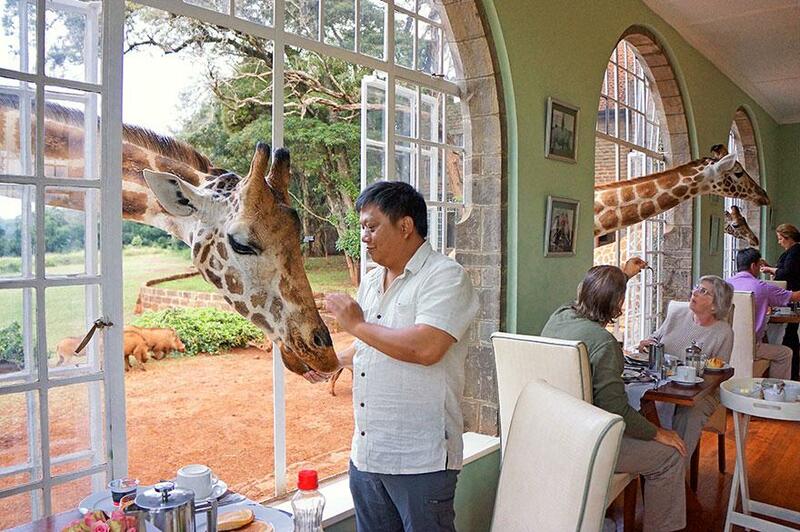 At Giraffe Manor, located in a suburb of Nairobi, giraffes belonging to the resident breeding and conservation program will join you for breakfast. If you’ve never heard of this place, you’ve probably spent an enviably small amount of time on the internet. 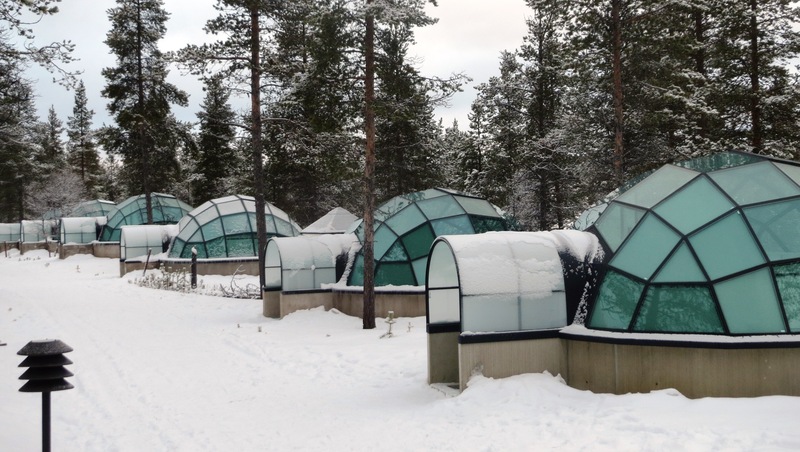 With its infamous glass igloos and log cabins, the Hotel Kakslauttanen offers an exclusive inside-while-outside winter experience. 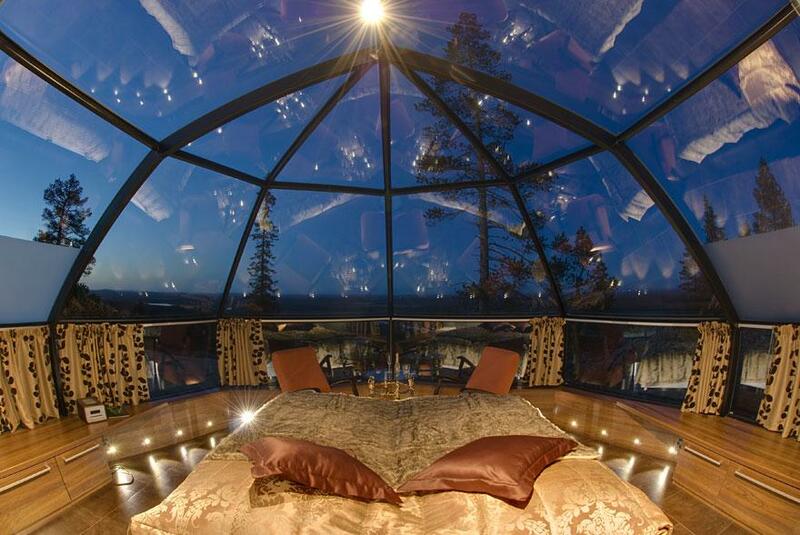 You know, so you can be immersed in the beauty of frozen forests and incredible winter auroras while simultaneously safe and comfortable inside your own private bubble of warmth. 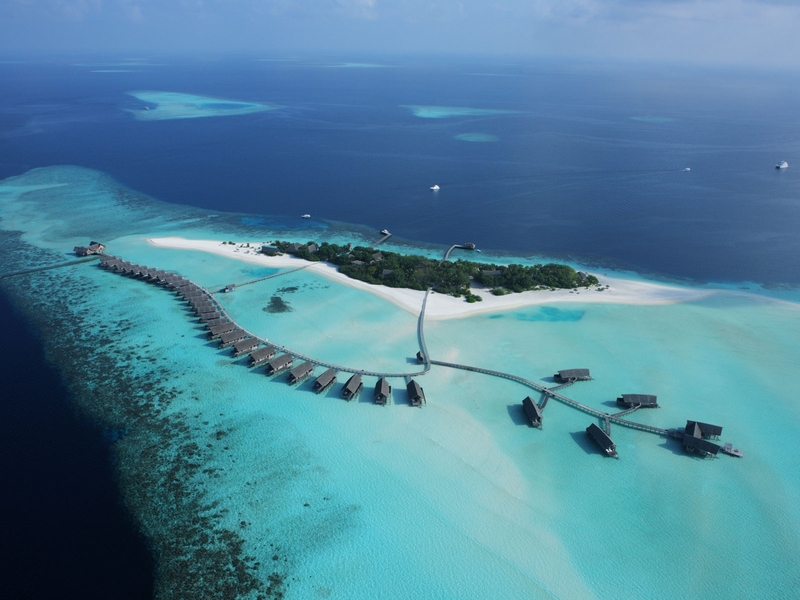 Just a 40-minute speedboat ride from the archipelago’s main airport, Cocoa Island floats as a cluster of 33 over-water suites (straight out from those sweeping white sand beaches you’ve seen in every tropical island fantasy you’ve ever had). 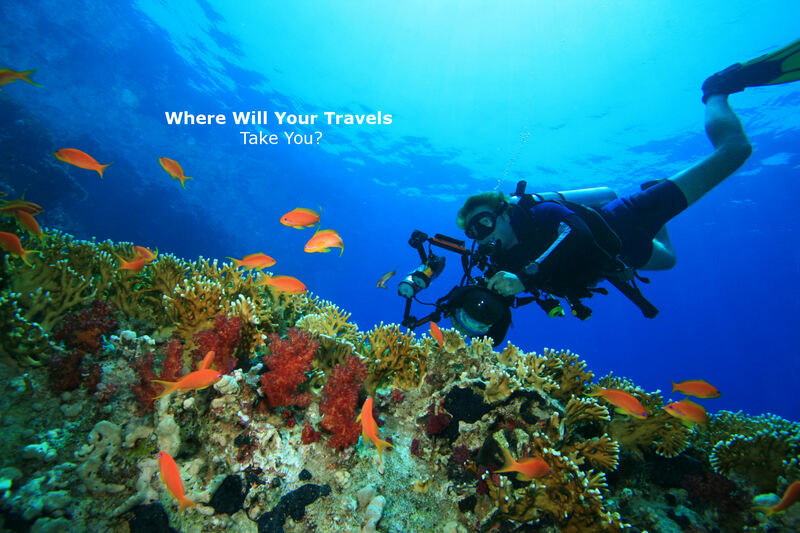 With two private diving reefs to explore, who’s got time for spa treatments? 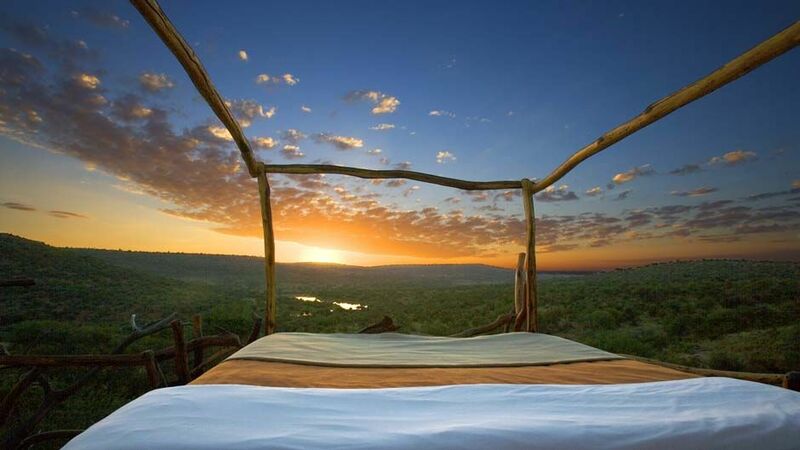 Two sets of outdoor “star beds” can be found in the Kenyan wilderness — the “Kikobo” beds overlook the waterhole from which they take their name, and the “Koija” beds sit on stilts over the Ewaso N’giro river. Each “star bed” is partially sheltered and contains a “Mukokoteni” (a specialty handcrafted bed on wheels, for moving into and out of the shelter). 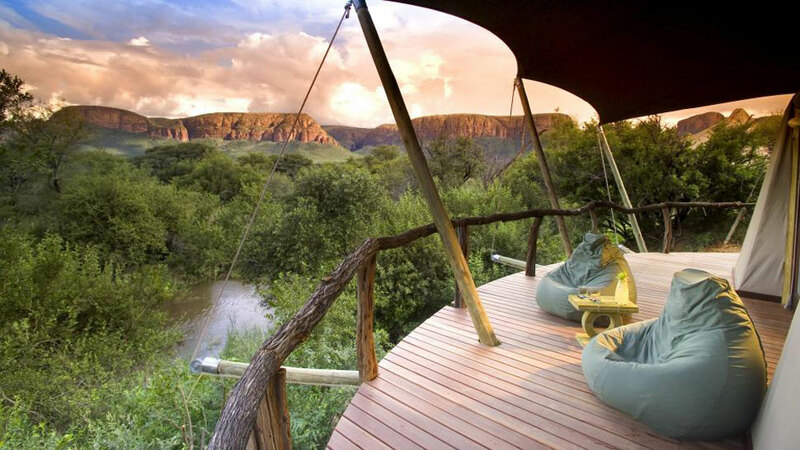 Kenya is known for its wildlife, so you’re bound to see some amazing creatures in this outdoor getaway. 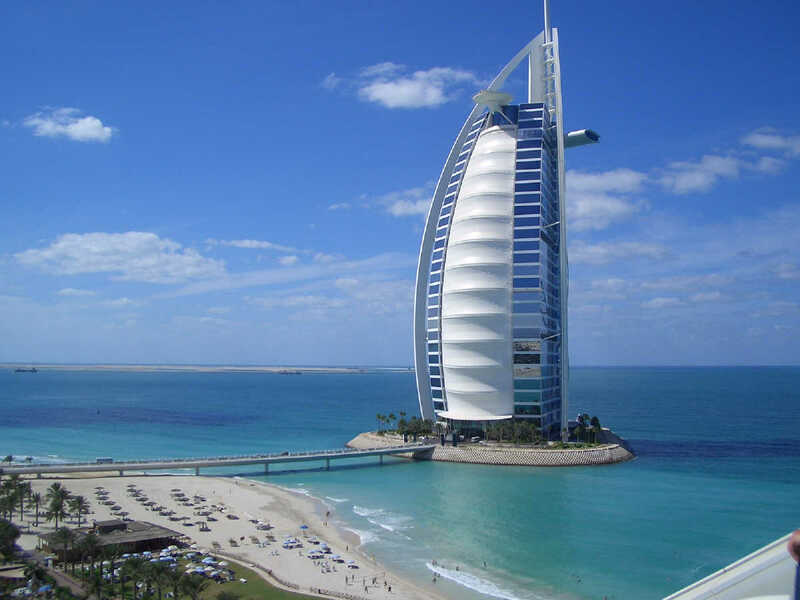 One of the tallest hotels in the world, the Burj Al Arab sits on a private, manmade island 1,000 feet offshore and is connected to the mainland by a private bridge. 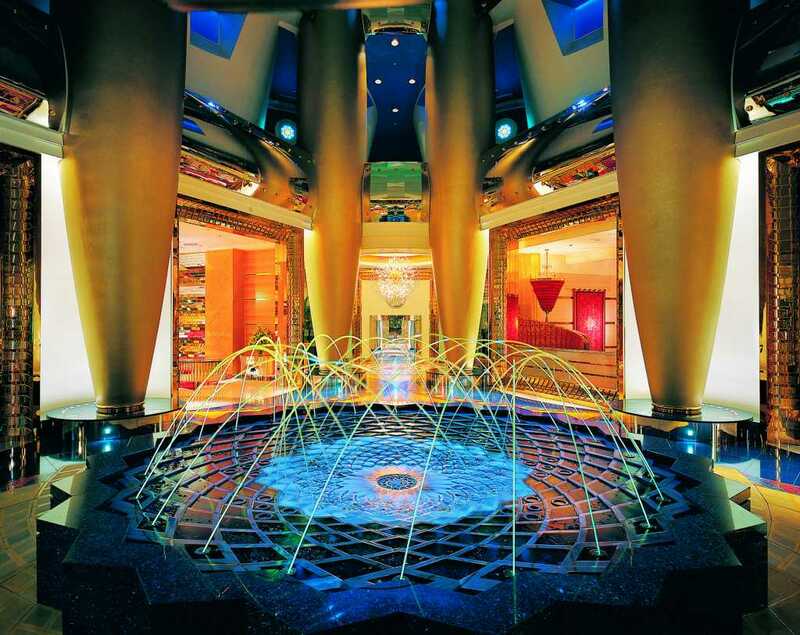 Inside the tower (designed to look like the sail of a ship) are 202 double-story rooms, the largest of which covers 8,400 square feet and is the 12th most expensive hotel suite in the world. 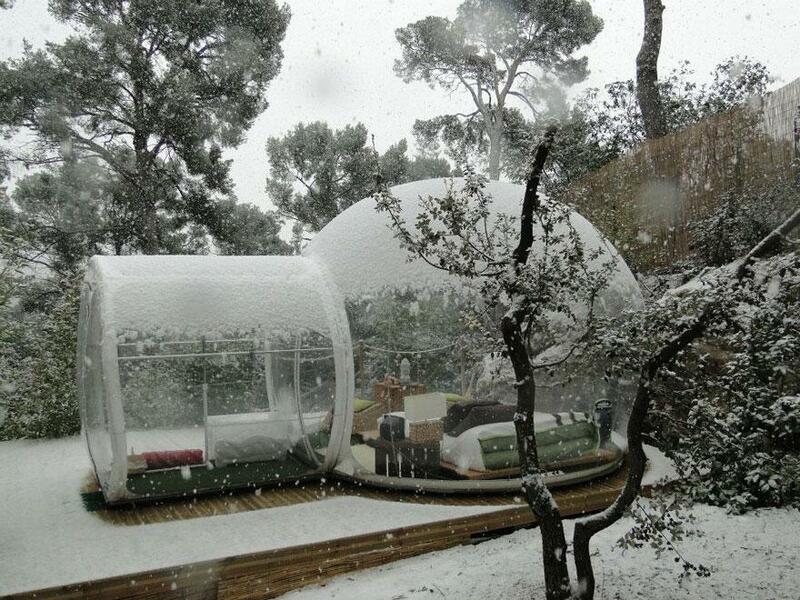 The multi-styled Swedish Treehotel comprises such rooms as: the Cabin, the Mirrorcube, the Bird’s Nest, the Blue Cone, the UFO, the Tree Sauna, and the Dragonfly. Though perhaps a little literal in the naming of the rooms, the architecture and execution at the Treehotel are pretty next-level and make for a unique experience in the Swedish forest. 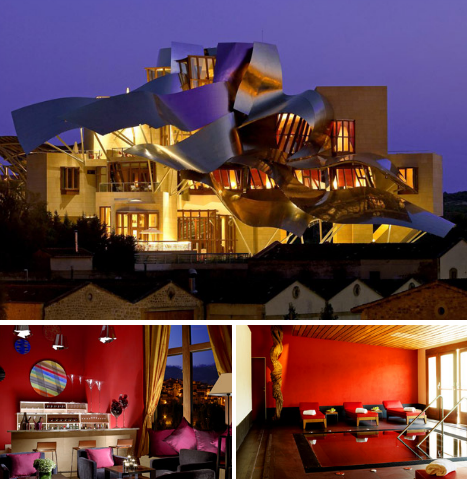 Designed by renowned architect Frank Gehry, this luxury hotel is situated in the heart of Spanish wine country in the medieval town of Elciego. The property is famed for its Basque-Riojan cuisine and also has a rooftop library lounge with views of the Spanish countryside. According to the resort’s website, the property’s creators conceptualized Dedon Island as a “kind of laboratory” for realizing experiments in outdoor design, organic farming, and sustainability. within the KwaZulu-Natal region of South Africa. No one around but you, the lodge staff, and the wildlife. Managed by the Kempinski Group of hotels and resorts, this seven-star property is the second most expensive hotel ever built. Might as well play the part and arrive via the private marina or helipad. 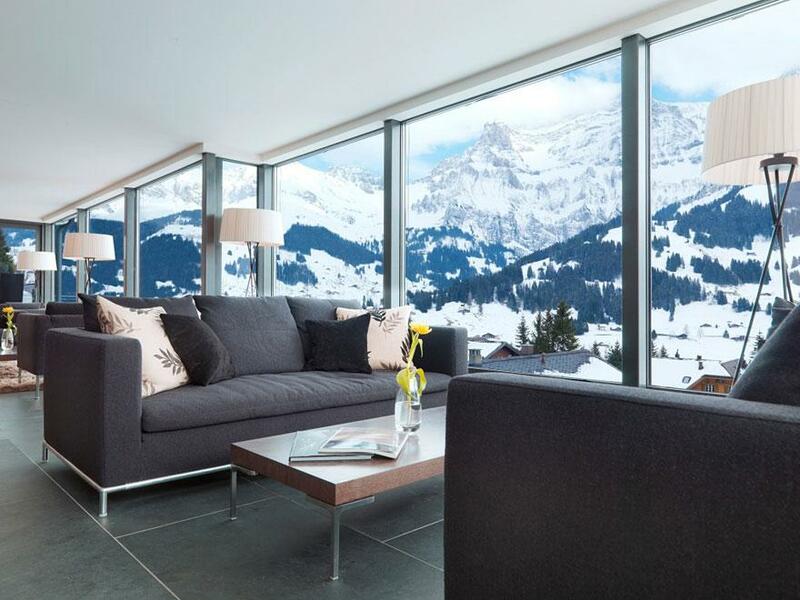 The Swiss ski village of Gstaad is one of the top resort areas in the Alps, and the Alpina is pretty much the top-of-the-line accommodations for those who have the scratch. 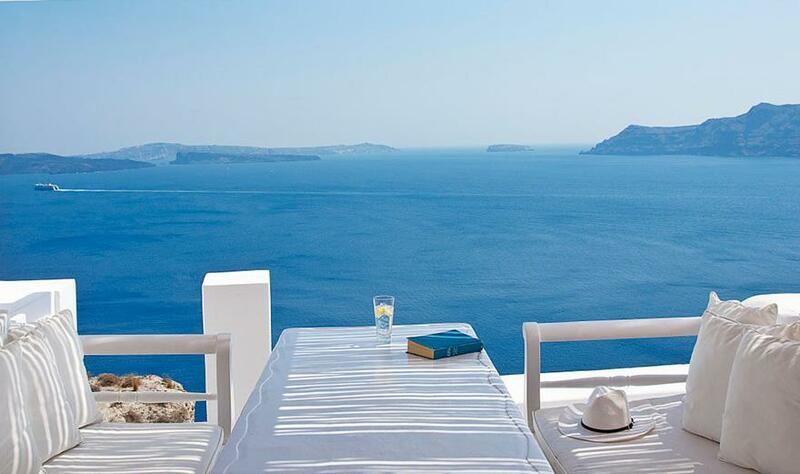 The views from your room’s balcony couldn’t get much better. 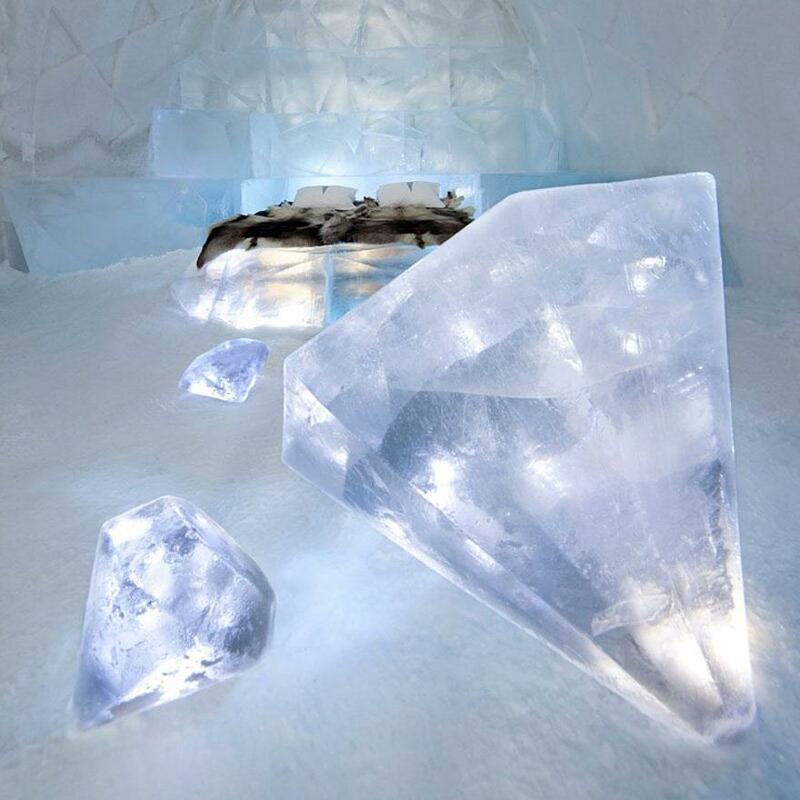 The first (and only) true ice hotel in North America, Hotel de Glace opened in 2001 and has been rebuilt every December since. 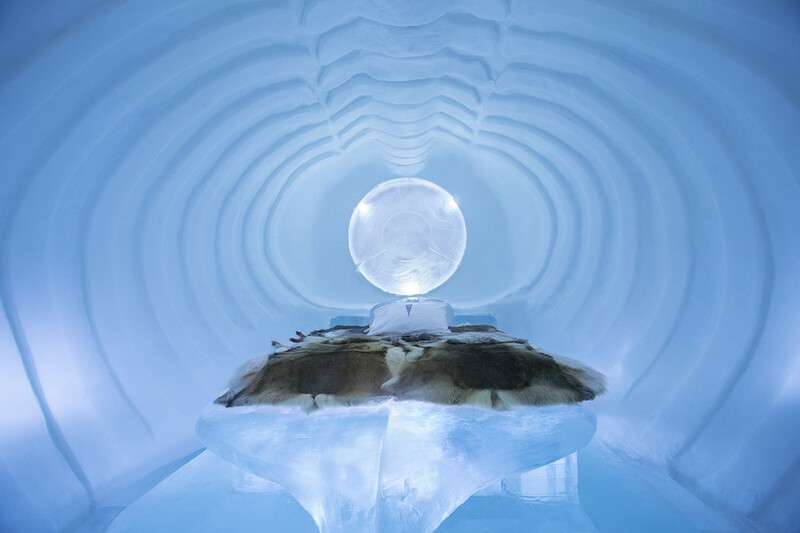 With a three-month lifespan, the features of this hotel are different each year, but it’s famous for its recurring chapel, bar, and grand ice slide. 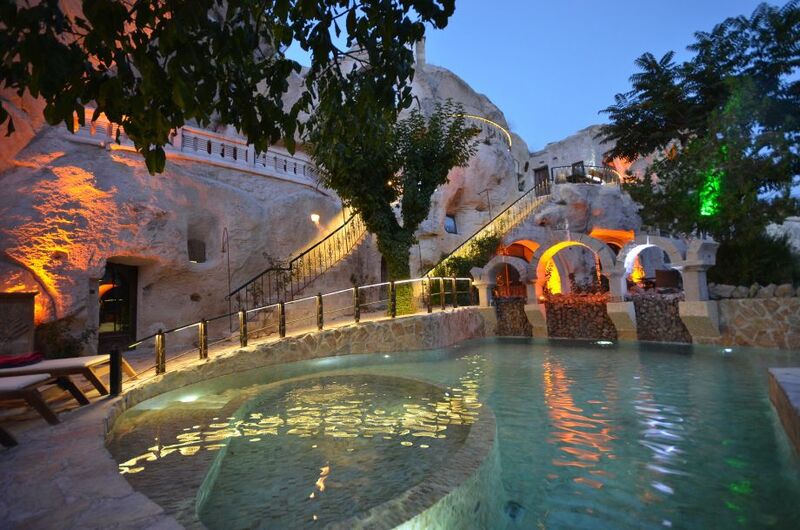 This recently renovated hotel, used since the Byzantine era as a monastic retreat, had been a getaway just outside of Ürgüp, in the Cappadocia region, for centuries before it was converted into a hotel for the public, which pretty much guarantees its awesomeness. 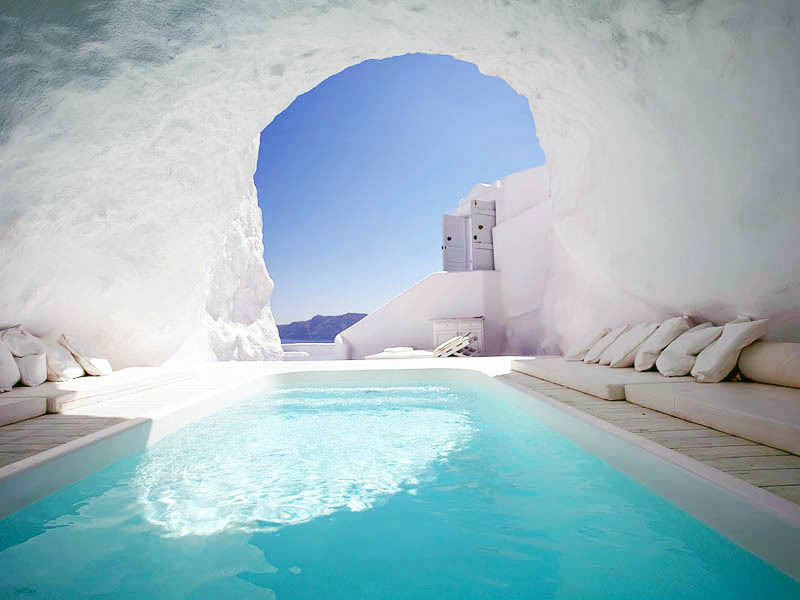 On Santorini (with its signature white-and-blue color scheme), the Katikies Hotel lends further credence to the idea that not only is putting a pool on an island surrounded by water not redundant, but you can do so just about anywhere in Greece and still achieve a killer view. 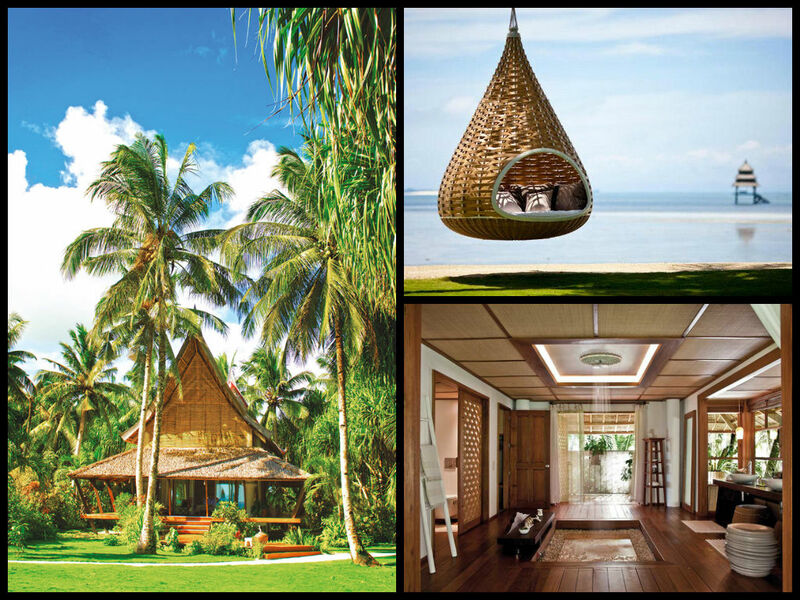 The mac-daddy of Thailand resorts, this place looks like the deserted jungle island you’ve always dreamed of waking up on after a bumpy flight to somewhere boring. 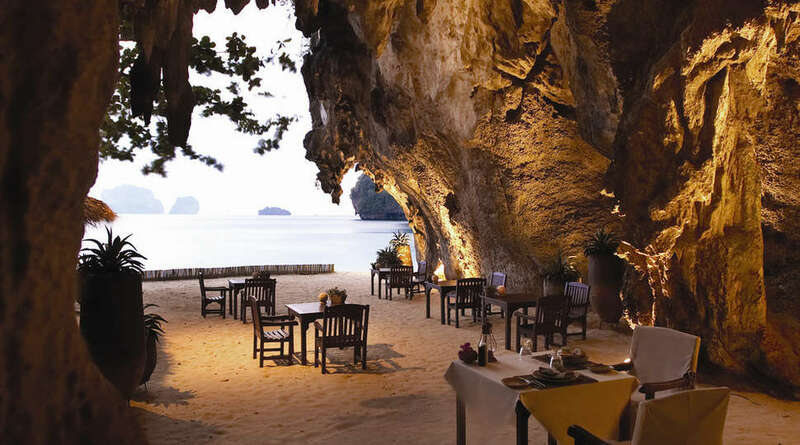 To top it all off, after your day of lounging in the luxury hydro-pool your pavilion is outfitted with, you can catch the sunset from this sandy beachside cave restaurant. 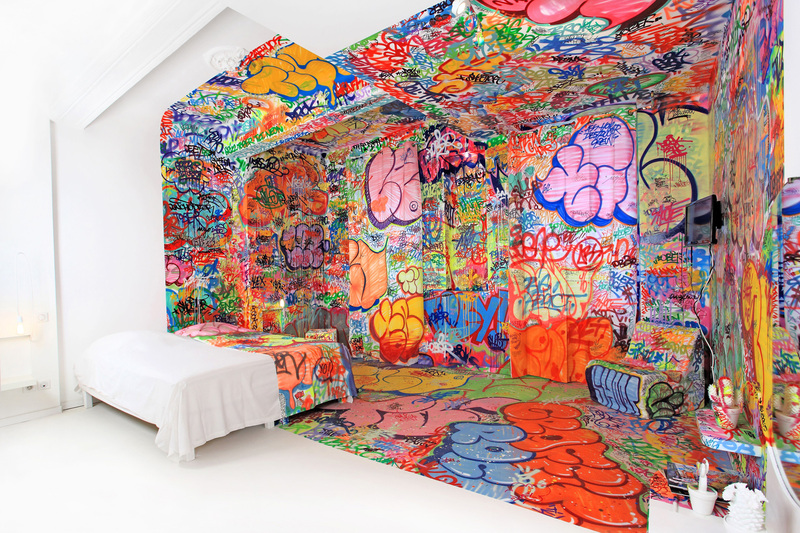 Situated in the heart of Marseille, each room at the Au Vieux Panier has been individually decorated by an artist or graphic designer of worldwide acclaim (and the rooms change every year). Not only is there a rooftop terrace where you can look out over the city center, but also a hotel library, perfect for a relaxing night in. 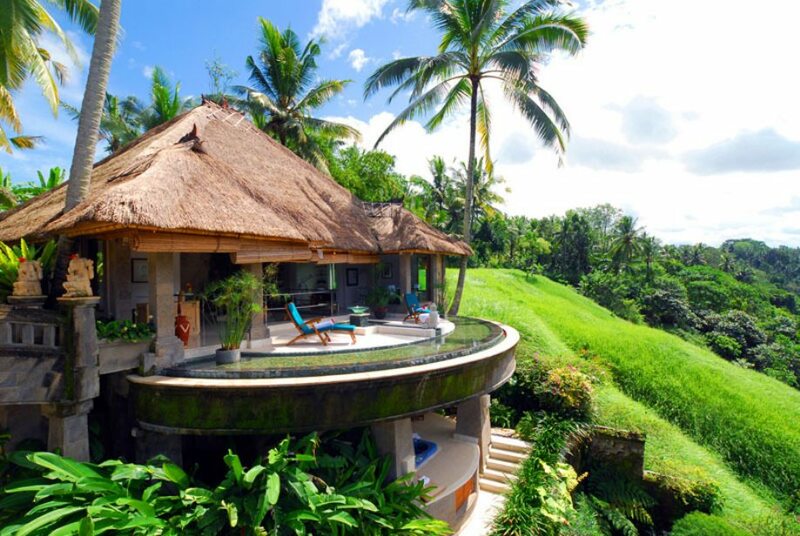 Carved out of the Balinese jungle by Irish designer Linda Garland in an ongoing project since the ‘70s, the Panchoran Retreat is a blend of art project, resort, and eco-garden. The retreat has been home to festivals, workshops, and generations of environmentalists conducting research year round. 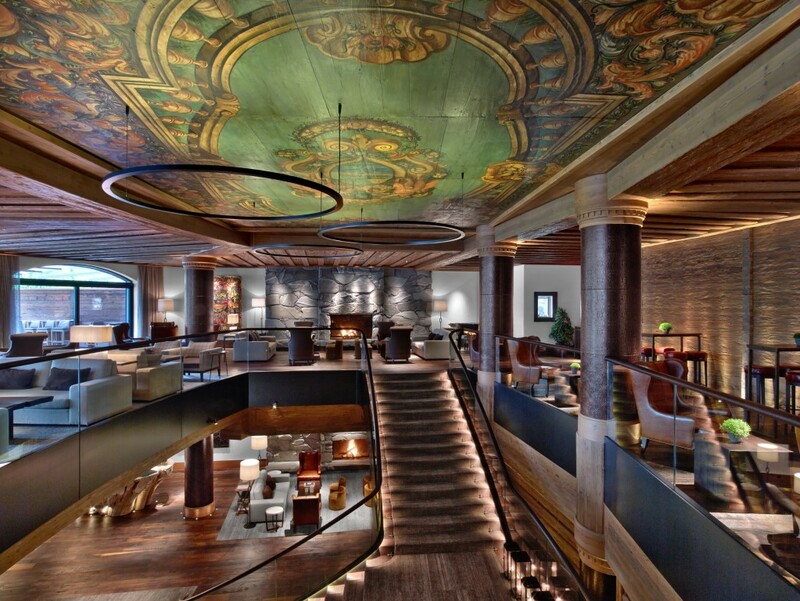 Built in the shell of a 1920s structure overlooking Milan’s golden square and the Milan Cathedral, the Boscolo Milano combines colorful avant-garde decoration with the luxury of five-star restaurants and spas. Half resort, half elephant camp, Anantara Golden Triangle sits at the convergence of Thailand, Laos, and Myanmar in the heart of northern Thailand’s mountainous jungle. Not only do they offer a full range of spa treatments, but they also organize elephant treks through the surrounding jungle and playtime with the herd’s baby elephants. Baby. Elephants. Need I say more? 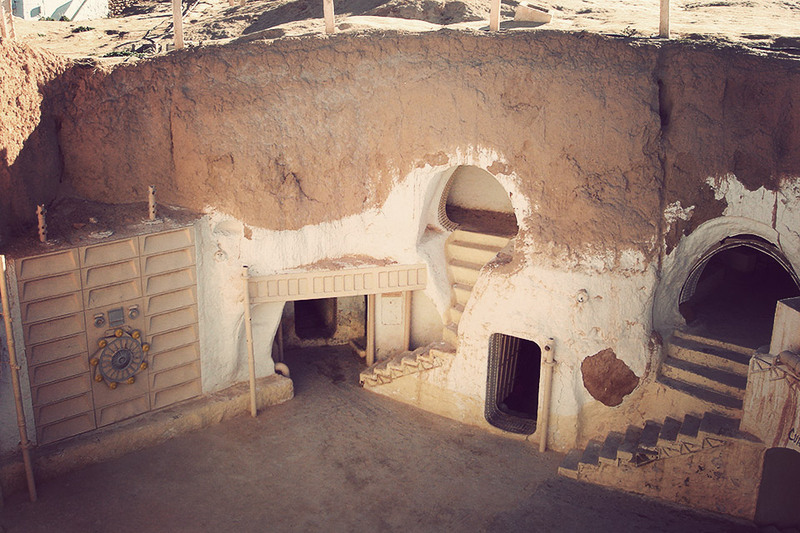 Okay, I know what you’re thinking, but suspend your disbelief for a moment so that I can tell you that not only are those the remains of Luke Skywalker’s home from Star Wars, but also, you can stay at them for $10 a night. Epic dream achieved! 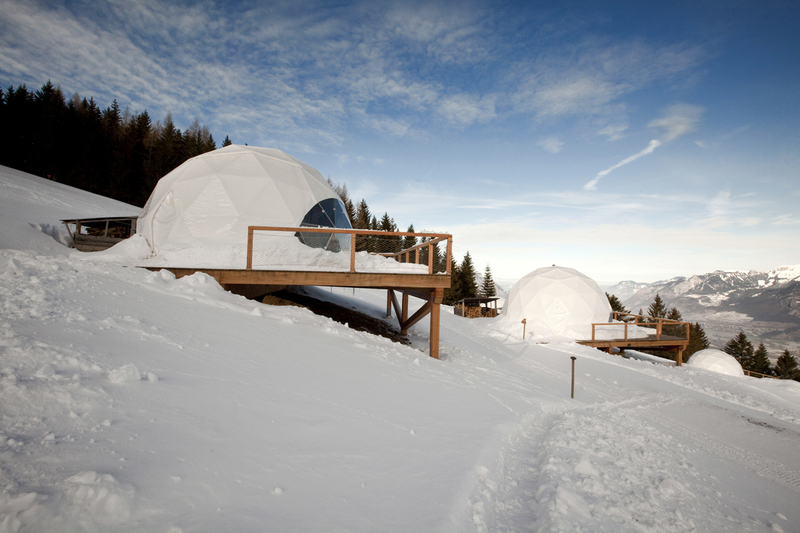 The Cambrian provides yet another option for luxury accommodations coupled with some extraordinary views of the Swiss Alps. 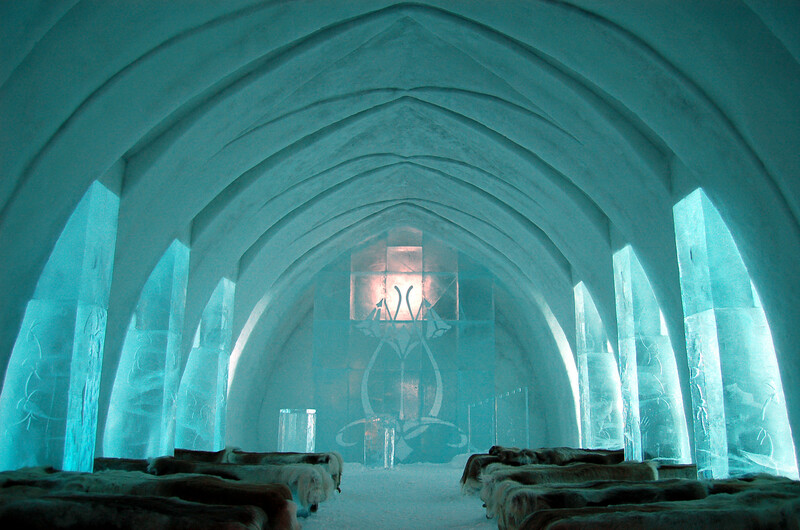 Sometimes “getting away from it all” involves going 155 meters underground (to the world’s deepest hotel room), and while no one thinks of staying in a historic silver-mine-turned-resort for their holiday, perhaps the accommodations at the Sala Silver Mine are enough to keep it in mind, rather than going to some boring island. 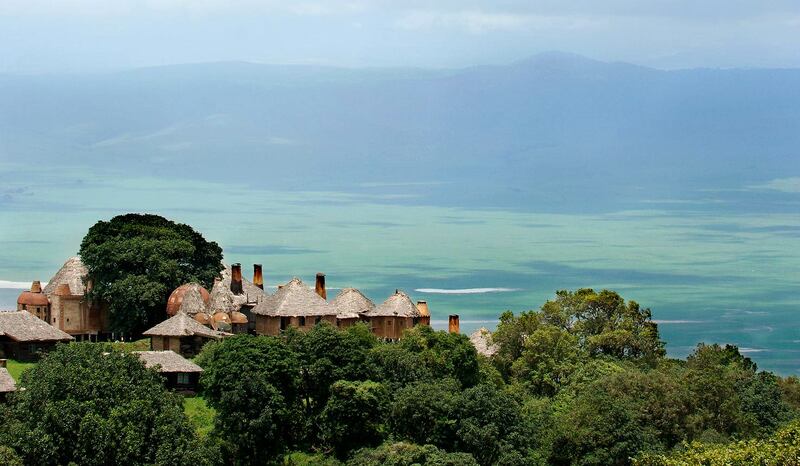 Marataba Safari Lodge is not a for-profit hotel, which alone should be a major selling point. The lodge is located within a massive game preserve, and its main purpose is to generate the revenue necessary to support the preserve’s continued projects. Their main goal is to restore the natural balance of flora and fauna in the region, with the help and involvement of people from all over the world. 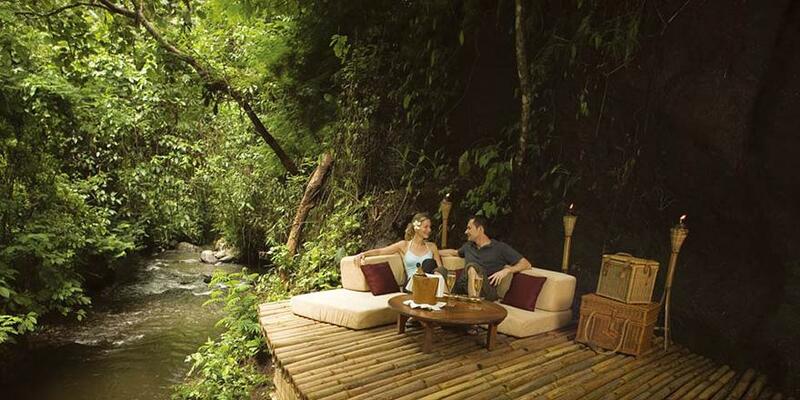 With a prime location like Bali, it would be pretty easy for a resort to skimp on just about everything and rely on the beauty of its surroundings. Thankfully, the Viceroy simply saw that as a challenge and took luxury to the nth degree with amenities including private airport retrieval via helicopter, direct to the only hotel-owned helipad in the district. 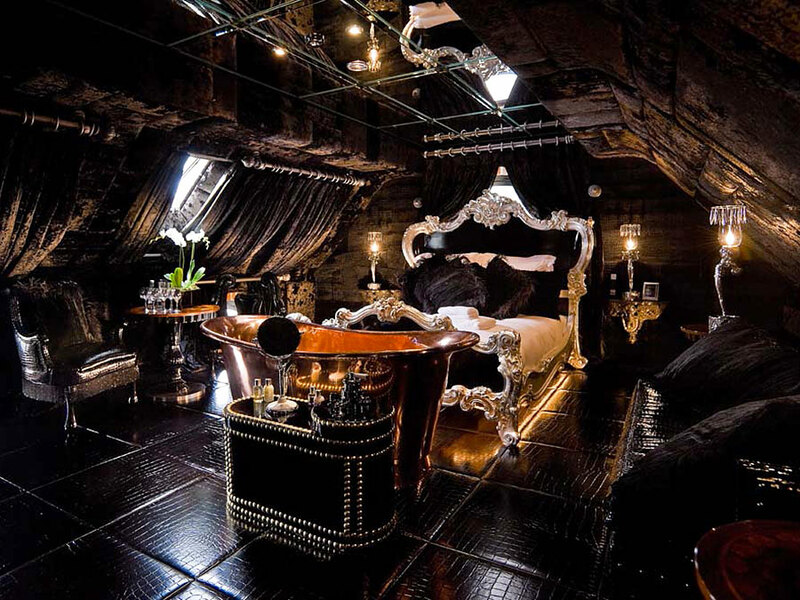 Part of a chain of hotels famed for their over-the-top opulence, the Crazy Bear Beaconsfield was opened in 2008. Its luxurious rooms were built inside a painstakingly restored 15th-century coaching inn, coincidentally the oldest documented building in Beaconsfield. 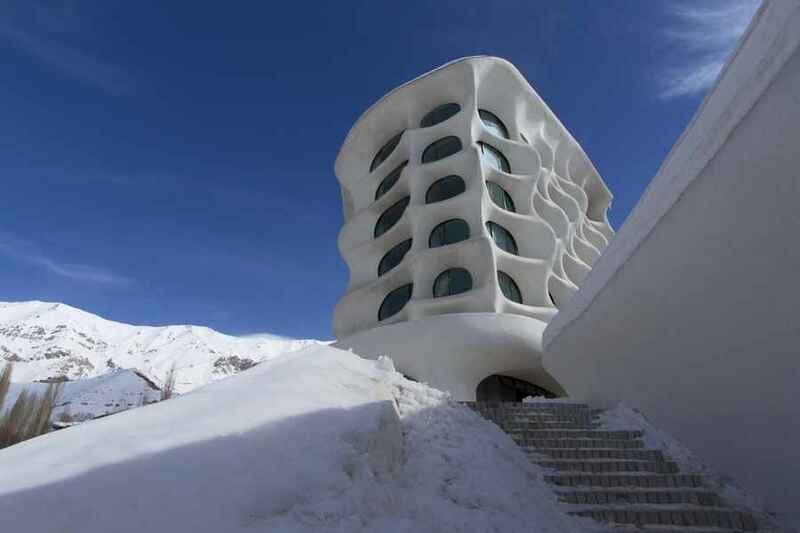 Just an hour outside of Tehran looms the Barin Ski Resort, a white fortress designed to mimic the snow-covered mountains that surround it, and with an interior that feels an awful lot like an igloo (though the architects opted for “topographic layers” instead of ice blocks). The Barin Ski Resort was designed, inside and out, to reflect and complement its natural surroundings, and the effect is truly stunning. 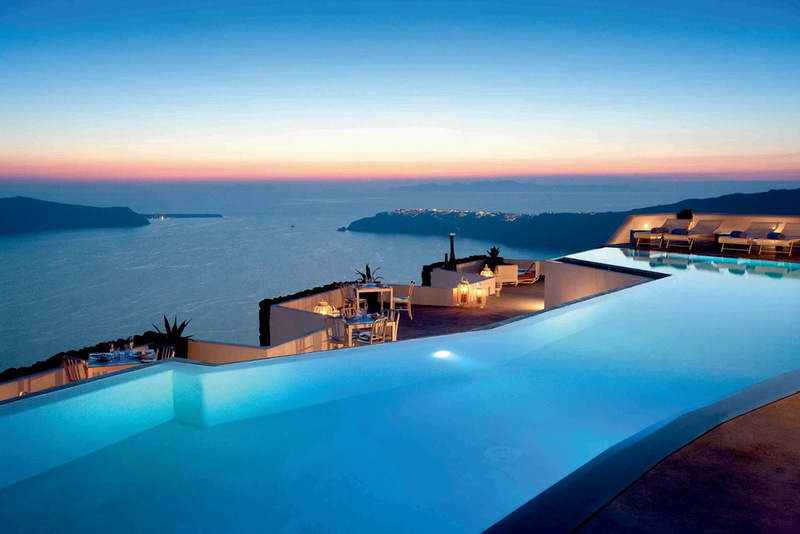 The infinity pool to end all infinity pools — this hotel in Santorini is so proud of its pool that you can even view it in blistering high-def 360-degree panorama on the website. 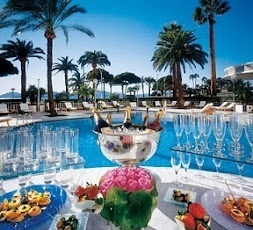 The luxury doesn’t stop at the pool, however, as every suite is decked out with all of the amenities one would expect from a luxury resort, plus some form of Jacuzzi. 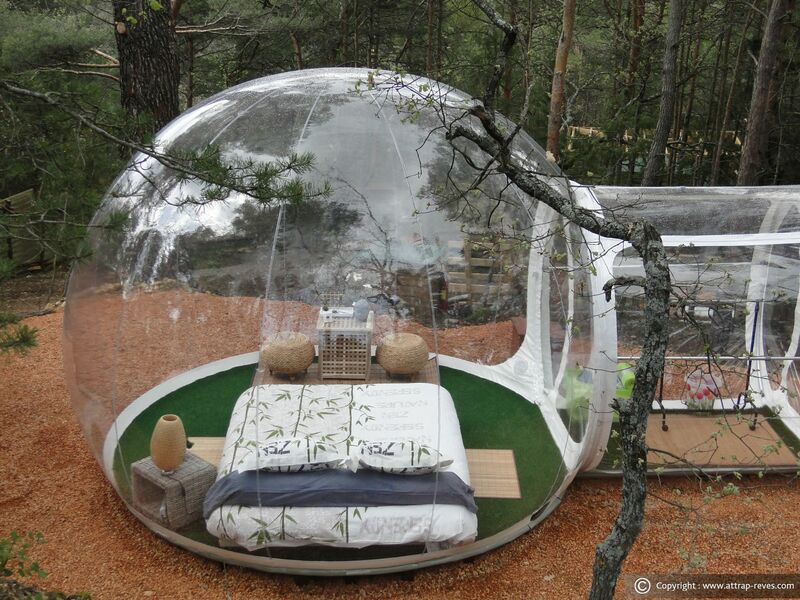 Another actively form-over-function locale, the space-pods at the Attrap’Reves would make me feel like I were the chief cosmonaut in charge of terraforming some faraway planet. What’s not to love about that? Built on a natural four-acre foundation in the center of Lake Pichola, Taj Lake Palace has been voted the most romantic hotel in the world. However, it was originally the royal summer palace of Maharana Jagat Singh II (and all of his reigning successors). The palace is so plush it has been used as the set for a number of British and Indian films and television shows and has hosted kings and queens from all over the world. 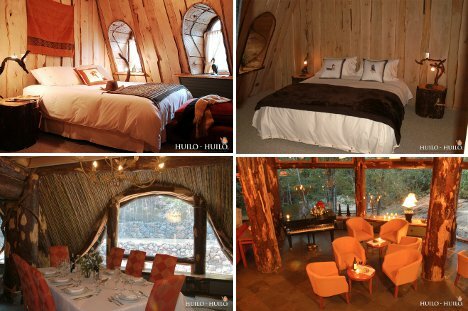 This Huilo-Huilo hotel is not only a manmade geyser, but also a UNESCO biosphere reserve. The 232 square miles of reserve surrounding the hotel have hot springs carved in the center of tree trunks and a variety of wildlife ranging from the puma to the pudú (the world’s tiniest deer). Located in Negril, and so much more than just another cave resort, this smaller lodging provides renowned all-inclusive packages for their 12 “exclusive cliff-side accommodations.” On the 10-acre property, the resort has its own cave restaurant to dine in while catching the sunset and bathtubs built right into the cliff. 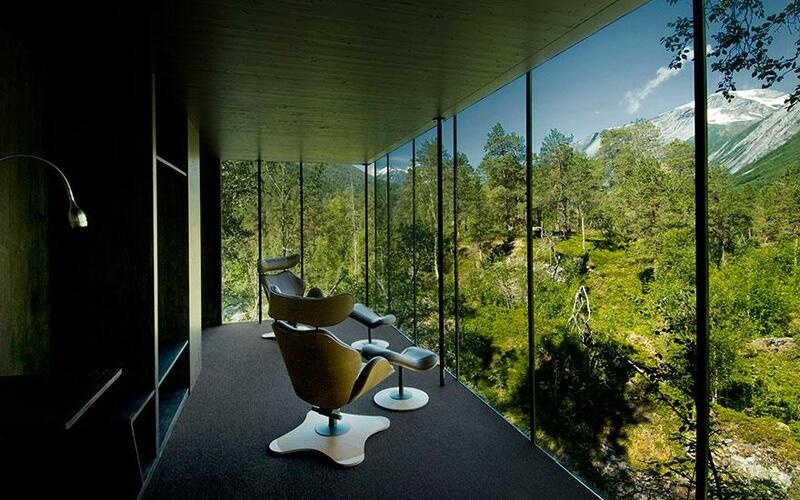 Europe’s first “landscape hotel,” this conceptual blend of architectural design and emphasis on nature led Norwegian architects Jensen and Skodven to build the seven stilted glass-walled cubes in an effort to maintain the illusion of complete integration with the surroundings. Each cube, and subsequent ‘experience,’ is unique. 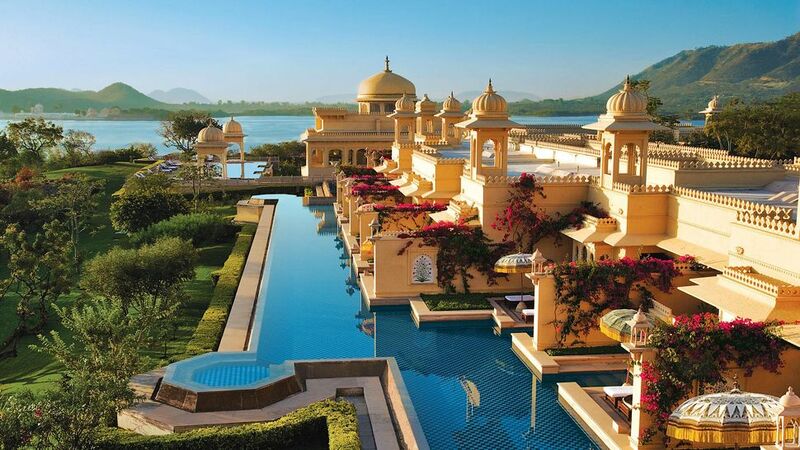 Perched at #4 on the 2012 list of World’s Best Hotels, the Oberoi Udaivilas sits on the shore of Lake Pichola in the palace city of Udaipur. The hotel’s architecture was modeled on real palaces of the Mewar region of Rajasthan (the largest state of the Republic of India, known as “the land of kings”) and includes sweeping arches and hand-painted domes. Designed to bring a touch of French elegance and luxury to a modern Thai setting, Sofitel So is decorated to reflect each of the five Chinese elements (water, earth, wood, metal, and fire). 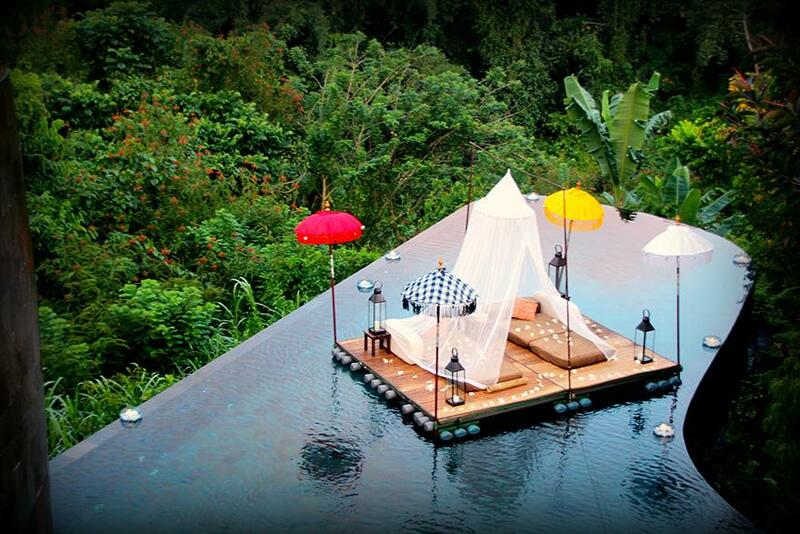 Looking out over Thailand’s capital city, the hotel also features a spa that apparently resembles a mythical forest. Honestly, there are few things cooler than staying in what looks like the Mexican equivalent of the Coliseum. 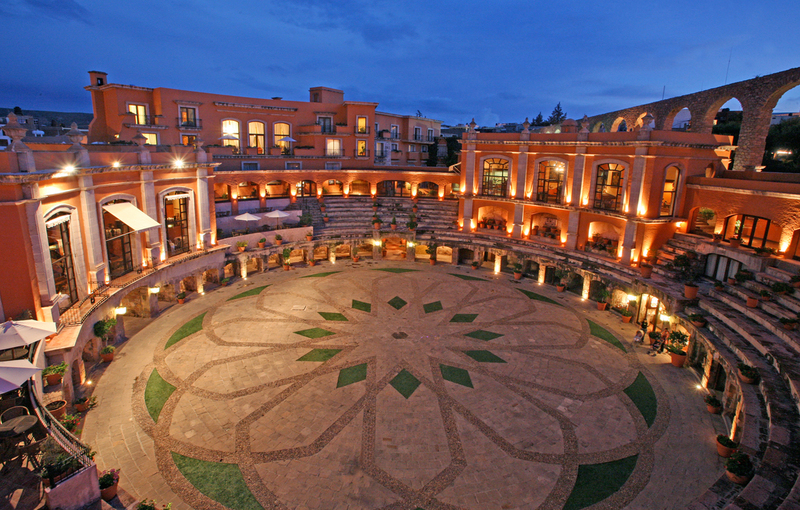 Part of the Quinta Real hotel chain, this former-bullfighting-ring-turned-luxury-resort is one of the premier places to stay in Zacatecas. Built entirely underground in a former army fortress, La Claustra is still 2,050 feet above sea level, despite being located far beneath the surface of the Gotthard mountain pass. 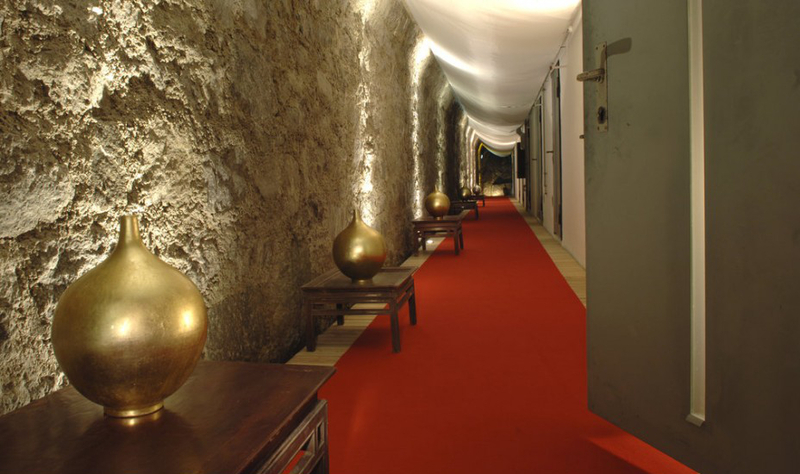 However, this demilitarized artillery bunker gets cold in the winter, so the 17 rooms are only available for booking between May and October. 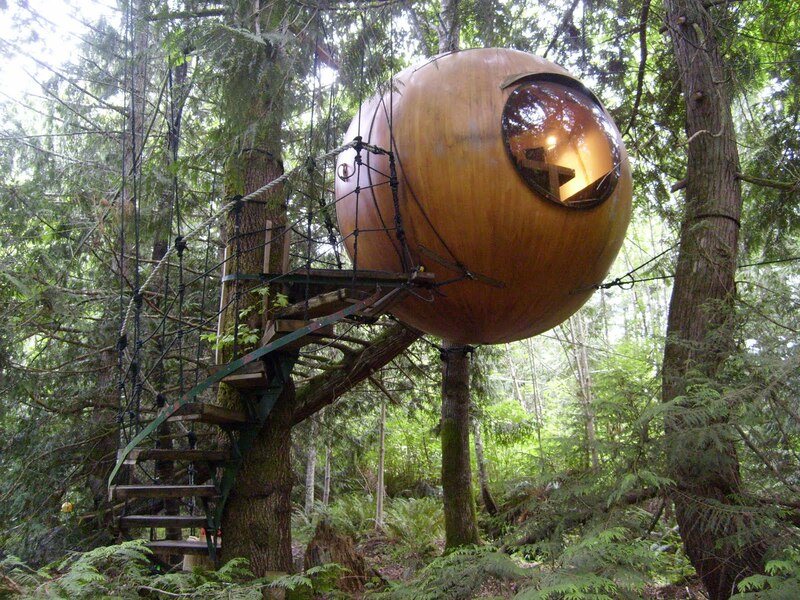 Set high in the trees of Vancouver Island’s temperate rainforest, each of these three spherical dens was handcrafted and precisely anchored in the canopy, 10 and 15 feet from the ground. While they may not represent everyone’s idea of luxury, the idea of gently rocking in the breeze while you fall asleep is incredibly appealing and would be a bliss usually reserved for native tree-dwelling critters and boat-owners alike. More of an art piece than a true hotel, Hotel Everland was a project by the artists Sabina Lang and Daniel Baumann (known professionally as L/B). The one-room hotel was built to be entirely portable and was moved around Europe five times before retiring to Switzerland. 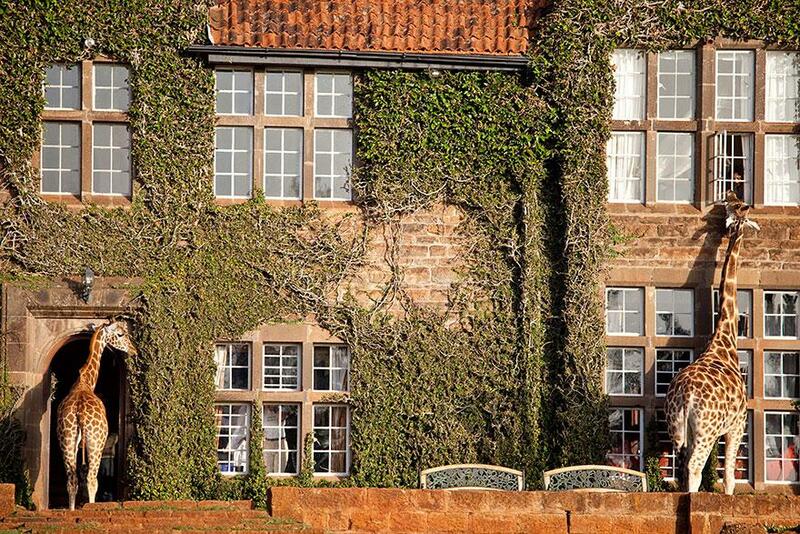 It can only be booked one night at a time, but comes equipped with its own record collection! Another epic cave-integrated hotel, the Hotel Ristorante Grotta Palazzese is located on the cliffs of Polignano, facing the Adriatic Sea. 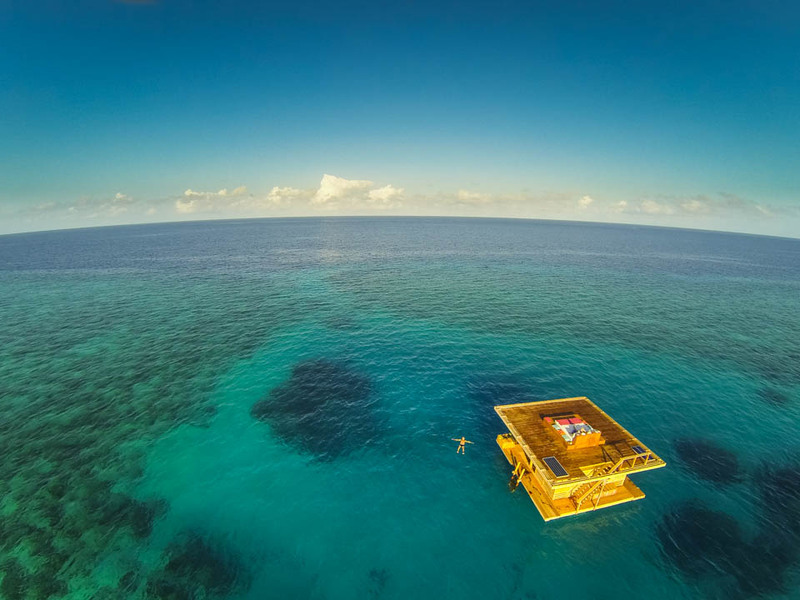 The cave restaurant, the hotel’s centerpiece, is where meals are served only a couple dozen feet above the crashing waves. You might not think “Oklahoma” when you hear the words “epic dream hotel” — but it’s somewhat comforting to think there could be a 221ft, Frank Lloyd Wright-designed tower with luxury accommodations just one town over.